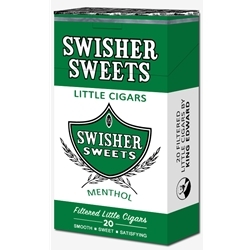 Swisher Sweets Menthol Filtered Cigars are available in Box 100's and packaged 20 cigars per pack, 10 packs to a carton for a total of 200 premium filtered cigars. Swisher Sweets are a unique blend of quality tobaccos, natural and artificial flavors, producing a very mild, easy and sweet tasting smoke. So when there just isn’t a lot of time to enjoy a cigar, Swisher Sweets comes to the rescue. Call Smokers Discounts and try these great Filtered Cigars today!